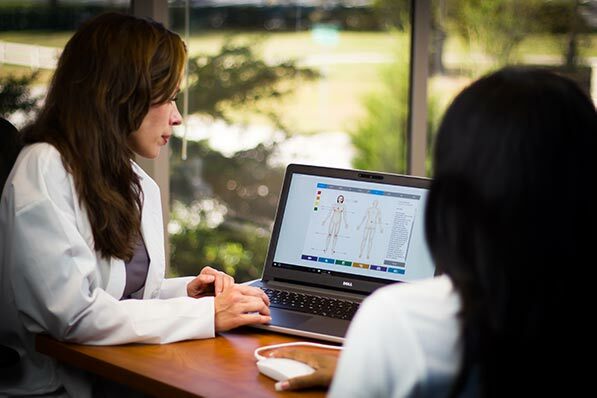 Our analysis software allows you to see beyond your client's symptoms to clearly distinguish the distortions or blockages of energy and information in the Body-Field, as well as the field's interaction with nutritional and environmental elements. Backed by more than 30 years of scientific research and over a decade of clinical studies and practitioner use, the NES Health BioEnergetiX WellNES System delivers an immediate and holistic analysis. Best of all, the software's robust analysis is easy to both perform and understand. 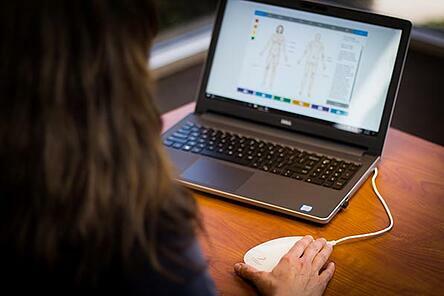 By simply connecting your miHealth or the special Body-Field scanner, with a single click and a few seconds, the software will return a richly detailed overview including multiple screens with a graphical presentation of the Body-Field's condition and how this field supports overall wellness. You also have the ability to remote-scan clients without them needing to come for an in-office visit. The scan is non-invasive and painless. There’s no risk to your client in being scanned. You simply ask your client to place their fingers on the scanner. Within seconds, the scanner offers a wealth of insights. The scan is instantly uploaded and analyzed by our proprietary and comprehensive decision-aiding software developed exclusively for the NES Health BioEnergetiX WellNES System. In moments, the strength, flow, and accuracy of the Body-Field is revealed on your computer screen. Now for the first time, you can see beyond your client’s complaints into their complete Body-Field, detecting any distortions that’s scrambling the energy and information systems that guide the body. Finally, as a health professional you’re able to see right to the source of your client’s issues and discomfort. No other test can do that and do it so quickly. Energy Analysis: identify energy blockages in the body’s musculoskeletal system and energy channels, as well as analyze the strength of the energy produced by various systems and organs. Informational Analysis: Identify information distortions in your body’s master control system: the Human Body-Field. Nutritional Analysis: highlight challenges in absorption and metabolic processes and identify sensitivities, malabsorption, and intolerance to certain foods from the body-field's perspective. Environmental Analysis: detect functional damage to the body-field related to environmental factors, toxins, and EMFs as well as the body-field’s ability to handle their impact when present. Emotional Analysis: identify unbalanced energy around core emotions, beliefs, and the ability to create and actualize in life. Also identify energetic distortions related to past shocks and traumas that may still be presenting as conflicts, impacting both physical and emotional wellness. What this means for you and your practice is that the software´s comprehensive analysis will give you a visual snapshot of the urgent distortions and blockages in your client's Body-Field. These distortions impact the guidance of the physical body, helping you to correct the body's guidance system and restore your clients' energy for life. In a recent large-scale comparative study carried out by the Centre for Biofield Sciences under the supervision of Dr. Thornton Streeter, 96.5% of the 240 participants in the control group experienced a positive change (compared to 35% in the placebo group). The study also demonstrated the efficacy of the NES Health System and its analytics, demonstrating that it was comparable to the combined abilities of 3 energy measurement devices: PIP (polycontrast interference photography), GDV (gas discharge visualisation) and EIS (electro-interstitial scan). You can learn more about the research and access the research report here. We would love to talk to you about how to integrate this incredible tool to your practice. Why not arrange a 1-on-1 consultation with us?